Do you walk the streets of Melbourne observing people sleeping in doorways or behind bus shelters? They resemble friends, or relatives, not much different from ourselves. Do you wonder what lead them to this moment? Questions of how we treat the marginalised are as pertinent today as they were centuries ago, or in 1989, when this story premiered. 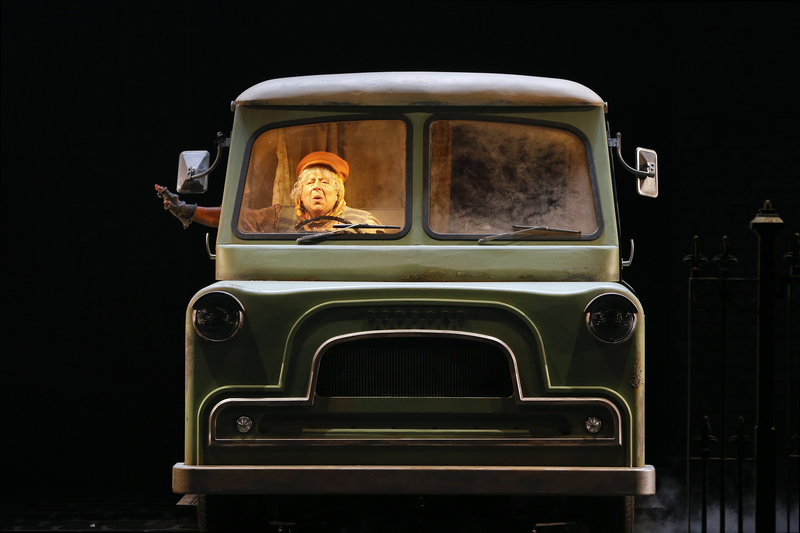 Melbourne Theatre Company’s production of The Lady In The Van is a modern classic you need to see. 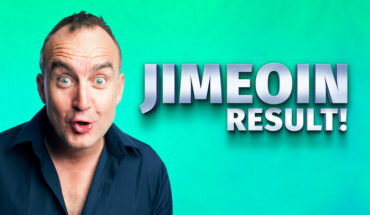 World-class, this bittersweet period work done in a driveway gives top tier performers including an international star, brilliantly imaginative sets, hilarious anecdotes, and a quirky plot, with attenuated direction. After the success of the 2015 film, it’s a story familiar to the broad public and you will instantly recognise the rotten van looking like as if painted in custard and the dirty attire of its argumentative female pilot. This homeless elderly woman driving her van takes up position along one of the ‘better’ streets in upmarket London. Think Fitzroy. She is slowly moved on by neurotic locals and an officious council, and edges her way anywhere…or to the newly acquired home of award-winning British writer Alan Bennett. At the time, as one of the character comments, he was producing plays not many people liked or understood. Observing her actions from his drawing room window, he somehow lets her park for three weeks in his driveway til she moves on. Over a decade on, she is still incumbent. What follows is an imaginative ride into the human condition, and meditation on ageing, class, and the impacts of trauma. About human relations, intimacy, and relationship, this version creates Bennet’s world beautifully, honoring the work through devoted attention to text, character, era, and production. You will feel you really are walking down an inner city gentrified street. Not only a good story, this superbly piece of theatrical art also speaks about stigma, and the writer’s craft. Whilst being entertained, there is lots of deep material. Through this marvellous social drama, you will laugh, cry, regret, reflect, and ponder what ageing will look like for you in our ‘modern’ society. 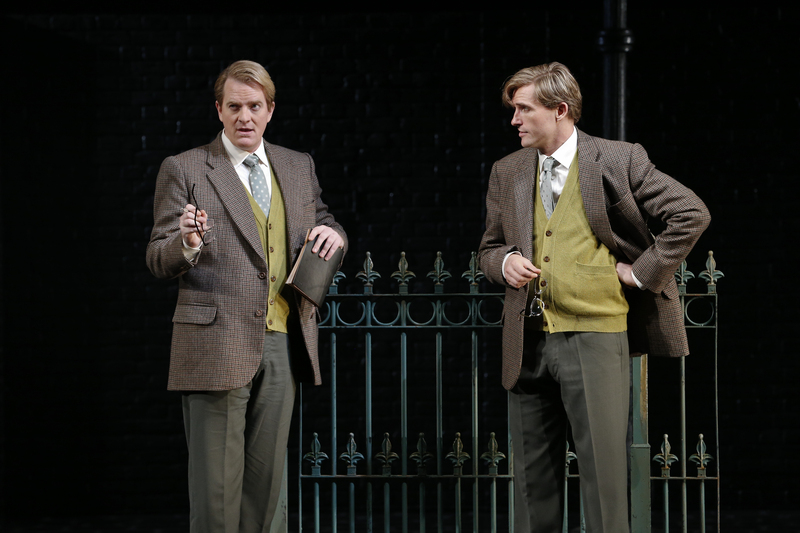 UK writer Bennett’s 1990 novel and 1999 play is set in the pre-Thatcher of the early 1970s. A homosexual, he lives solo and is psychologically attached to his elderly mother, a widow who lives in a northern England he originated from but will never return to. Bennett gives us the very best playwriting in English to tell his magical, cathartic story of this tragi-comedy which details the writer’s mother’s ageing and subsequent death, his progress as writer, and the marvellous intruder herself. MTC’s production allows the superb script, with excellent performances, to take us on this grubby fairytale. Bryant gives us direction that is subtle and refined, supporting the writer’s intention and tone- of gentle inquiry, bearing witness to the fragility of human life. He allows the words to delineate the characters, supported by Alicia Clements’ colourful, fun, and creative set and costume design, which situates the tale in a both an ordinary and imaginative space. Bennett speaks of everyday reality as The Writer records observations and thoughts in a daily diary, but describes the inner world of the characters, and audience, as we watch a metaphysical divining emerges. The cast rocks. 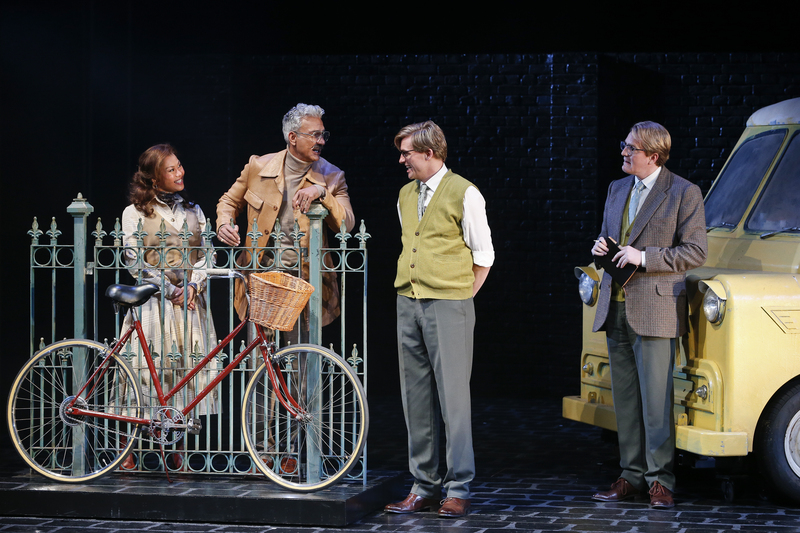 This play is an actors’ delight, with well drawn characters who are vulnerably flawed. An excellent cast’s deep preparation and refined craft presents well-outlined characters from the everyday world, and they take you on the ride down this Camden Town street parable. Their sophisticated artistry touches and breaks your heart, makes you laugh then shun actions with shame,elevating you into compassion- for the lady, the writer, and ourselves as a people. This version has many delights, not the least of which is a set that is both everyday and out- of-this-world, with a large Bedford Van which levitates. The production values are so good you also could be the bystander who wants to tiptoe over and into the van were the stench not so strong. There are layers of authenticity here with old plastic bags, paint tins, discarded ragged clothes, and dirty sneakers as well as discarded excrement. 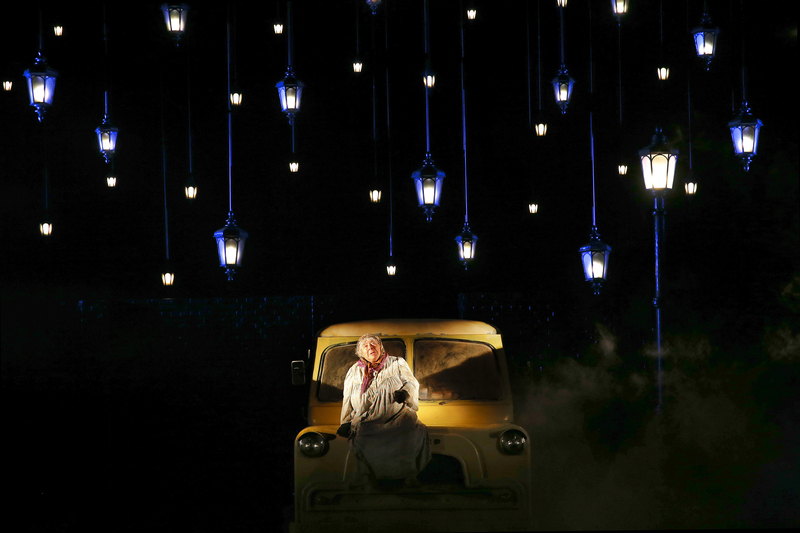 Matt Scott’s clever 1970s lighting highlights and lowlights the action, and Mathew Frank’s sound design and music evokes both era and emotion, with scenes occurring solely in the writer’s front garden. Neighbours peer over fences, revealing class concerns. Blackmailers from her past visit at night. Social workers snoop and document. Lovingly executed with deft skill by the two Alans (yes, two actors render the mind and body of the writer, tenderly and sensitively drawn by James Millar and Daniel Frederiksen) suited up in clumsy neutral jacket and pants, and the world renown actress, Miriam Margolyes as Miss Mary Shepherd, this version is well rehearsed and stands stage-ready in full marvel. Dalip Sondhi offers a lively bourgeois neighbour. 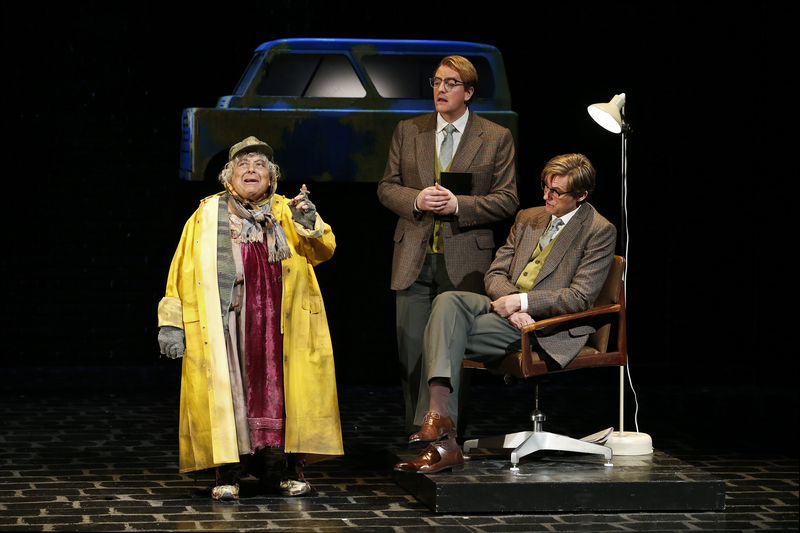 Margolyes as the female protagonist is a living work of literary and acting greatness. Experienced with character acting and with many years of stage mastery behind her, she lives to serve up the full person that is our vulnerable older woman. Her character takes up alot of space – textually, metaphorically, physically – yet Margolyes looks like she’s just nipped out for a quick 2km jog. She gives so much in this role, taking us into Miss Shepherd‘s deeply private pain, and embodies this tough yet fragile survivor with grace, insight, a lashing of strong language, and peerless dramatic rigour. The character is one of theatre’s greats, up there with a Beckett, Brecht, or Checkov as is the actor. She falls out of the first van looking every bit a timeless gypsy. Sporting clothes that may not have been washed for decades, revealing vestiges of bodily functions, she is layered up as the homeless, mentally ill or socially disconnected are, resembling a street urchin. Unafraid of verbal stoushes, barking more than talking, she takes on chardonnay socialist yuppies, regulatory bodies, thugs, and stalkers with a voracious impertinence. Bennett shows that characters like her invent stories to protect themselves, to ward away parties, to grieve for their pasts, and because they may or may not have forsaken their own sanity at some stage along the path that is a lifetime. The play shows identity is the story we tell about ourselves. Revealed is a troubled past, involving the Church, music, unkind kin, and cruel historical regulatory systems, yet though broken internally, there is lots resilient in the old lady, and she engages directly with her newest roadside companion, challenging him on his own secrets. The Writer learns as much from her as he appears to offer her. What is depicted is a a transcendental exchange, something to be valued as the world as high capitalism was nascent. There is so much to love about this production. The Georgie accents, the pre-1980s inner city nonchalance of the of wealthy liberal whites, it is England in a time of change. A new world order is dawning. 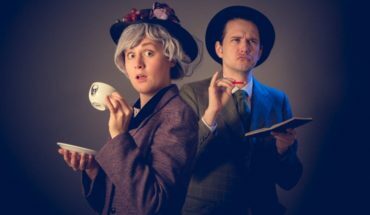 Miss Shepherd comes from the mid-twentieth century past, with all its cruelties yet her survival to this moment crowns her journey, as does her deep bond with The Writer. She dies in the van and he discovers thousands of pounds secreted amidst her rubble. 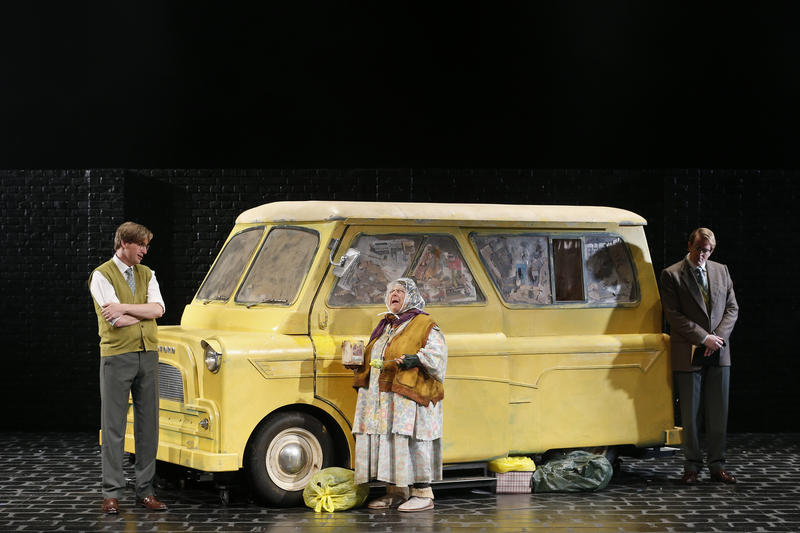 The Lady In The Van shows 2 February – 6 March at 6.30pm Monday- Tuesday, 8pm Wednesday – Saturday, 1pm Wednesday, 2pm Saturday (120 mins with 20 min interval) at Playhouse, Arts Centre Melbourne. Book tickets here. The venue is accessible with audio-described, tactile, open captioned, and Auslan dates.